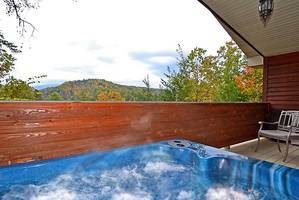 Gatlinburg Cabin Rentals private cabin for two featuring huge red heart shaped jacuzzi, king bed, nestled on our beautiful and secluded private mountain top - fully equipped kitchen, Free Wi-Fi, flat screen TV, DVD player, fireplace, private deck overlooking wooded view. 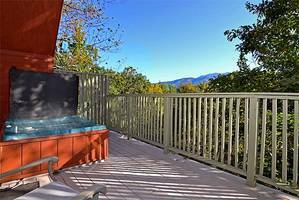 Exclusively for couples, anniversary, birthday, special getaway Gatlinburg honeymoon hideaway, or Gatlinburg honeymoon cabin rental. Not well suited for children or families. Maximum Occupancy: 2. No pets, no smoking. We came to celebrate our 9 year anniversary. This was our first time to book a cabin and we could not have picked a better place. Our cabin, First Love, was very clean and easy to find. The staff checked on us everyday by text which was awesome. We ate at the Alamo and the Burger Barn. Both were very good. This is the best trip we have had. We will be back next year and every year after that. Thank you so much for making our anniversary special. We booked First Love for our honeymoon. The cabin was ready upon arrival. The directions were accurate and precise. We visited Dolly Parton's Lumberjack Adventure along with all the shops in Gatlinburg and Pigeon Forge. The best restaurant was Poynor's Pommes Frites in Pigeon Forge. We will be staying here again. My wife and I chose to stay with Honeymoon Hills for our honeymoon. Our cabin was cozy and comfortable. Some of our favorite attractions were Ripley's Aquarium, Mountain Coaster and the Guinness World Records Museum in Gatlinburg. We also enjoyed the Adventure Park Zip line and Tanger Outlets in Pigeon Forge. Our favorite restaurants were the Alamo, Back Alley Grill and Three Jimmy's. We absolutely loved our stay here. We will definitely return to stay with Honeymoon Hills. The customer service is great. When we arrived at our cabin our television wasn't working. Shortly after we called and reported the problem a staff member arrived and fixed our television. We also enjoyed the free tickets we received through Honeymoon Hills. This trip was perfect and we hope to come back soon! We had an awesome stay at Honeymoon Hills. We came for vacation and stayed three nights. The cabins are absolutely beautiful, clean and well taken care of. 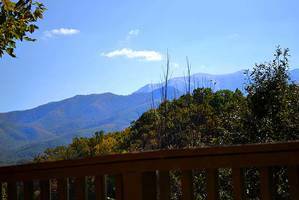 We had easy access to both Gatlinburg and Pigeon Forge. We definitely look forward to staying here again. Thank you for all your hospitality! I really enjoyed my stay at Honeymoon Hills. We came to celebrate our honeymoon that was really overdue. We enjoyed many attractions including Adventure Park, Ripley's Aquarium, Ripley's Mirror Maze and Ripley's Moving Theater. The Aquarium is one place I would recommend to everyone. The First Love cabin was everything we expected and more. We loved that is was like home away from home. We will be back next year for sure!! We came to celebrate our 20th anniversary. The cabins at Honeymoon Hills were perfectly priced and in a great location. Our cabin, First Love, was clean and spacious. We felt very secluded although we were close to all we wanted to do in town. We love Gatlinburg! There are so many things to do in Gatlinburg and Pigeon Forge that you are never bored any time you are there. Plus, it’s so relaxing! The people, views and food are great. We visited the Titanic Museum, Ripley’s Aquarium, and Star Cars! Shopping and dining too! We loved First Love cabin, so clean and secluded. We will definitely be back. Honeymoon Hills is a great place to stay! Honeymoon Hills and the Chapel at Honeymoon Hills made everything excellent for our wedding and honeymoon. Nothing went wrong! They had everything covered to the exact detail. Even at the last minute, they still came through for us. Thank you so much! My new husband and I contacted Honeymoon Hills on a very short notice for a wedding ceremony and a honeymoon cabin. We were given very courteous and kind service even giving them such a short period of time until arrival. The Honeymoon Hills and the Chapel at Honeymoon Hills staff went above and beyond to assure our guests, my husband and I were all able to arrive safely by changing our reservation on short notice due to weather conditions (huge snow). The wedding ceremony itself was excellent. We will hold dear in our hearts the words spoken to us. We spent our peaceful honeymoon in the First Love cabin. The soft lighting, heart shaped jacuzzi and fireplace made for such a romantic setting that we hated to see it end! 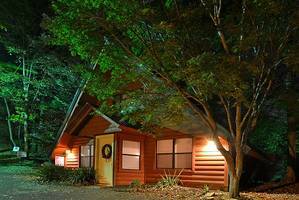 We would highly recommend Honeymoon Hills wonderful cabins and helpful staff to anyone. Thanks for a wonderful wedding. Honeymoon Hills really took the stress out of our wedding. Our cabin, First Love, was very comfortable and very convenient. The staff was very friendly. The Minister performed a very beautiful ceremony. My husband and I are starting our blessed marriage with wonderful memories of Honeymoon Hills. 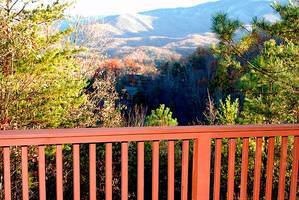 After staying here my husband and I have considered moving to Gatlinburg! Everything about Honeymoon Hills was exceptional! The staff, the service, accommodations and the atmosphere. This was our second stay at the resort and once again it was awesome. First Love was perfect...clean, comfortable, romantic and cozy. It was the perfect getaway to celebrate our anniversary and enjoy the romantic atmosphere of the Smoky Mountains. We will certainly be back again and recommend this resort to our friends. Thanks for an awesome 26th Anniversary. 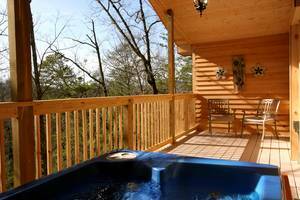 My honey and I really enjoyed our stay at the First Love cabin at Honeymoon Hills. We visited here to reconnect our love and decide if we would keep our relationship of 8 years together. After a few romantic days in the beautiful cabin we decided to repair our love and become one big heart again, just like the heart shaped jacuzzi in our cabin! Our cabin was peaceful, beautiful, clean and romantic. I recommend anyone to this place and we will be returning soon! God put us together! When we were getting married, we chose a place that was peaceful and surrounded by the beauty that God created. The setting and atmosphere of the chapel were outstanding. The cabin was all we could wish for. The peacefulness and quiet was perfect for our honeymoon. Dr. Dan provided insight to marriage and our ceremony was beautiful. We are glad we chose Honeymoon Hills for this step in our lives together. The staff at Honeymoon Hills was excellent. They made our wedding go off without a hitch and ease any fear we had. I could not have planned it any better on my own. The cabin was perfect, clean, comfy and romantic. We will be back! Thanks to everyone on your staff! We came to Gatlinburg and celebrated our honeymoon at the cabin First Love. We were very satisfied with everything. The cabin was very nice, well supplied and sufficient. The heart jacuzzi was a really nice touch. The cabin was much nicer than a hotel and the price was definitely right. Thanks for making our stay enjoyable and worry free. We were here for our honeymoon. Our cabin was so easy to find compared to others we have rented. Upon entry, the cabin was very warm (very cold outside), inviting, very clean and homey. The place settings at the table made us immediately feel welcome. The fireplace gave our cabin a warm, romantic feel. The kitchen was very well stocked and very clean. 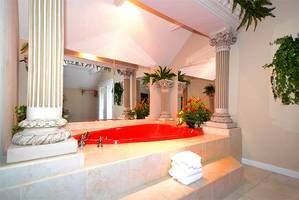 The jacuzzi has a romantic feel with lacy drapes around the mirrors. We will definitely recommend this place to friends. We enjoyed our stay. Our cabin was wonderful. We celebrated our 6th wedding anniversary. Everything was very romantic and secluded, just what the doctor ordered. 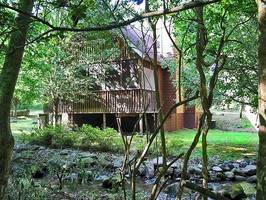 So great for my wife and I to get away from our daily routine and spend quality time alone in a Gatlinburg cabin. Very peaceful, will return again soon! From the moment of placing the initial call we knew this was the perfect place for our wedding and honeymoon. The website was so helpful and very accurate. The personnel was wonderful. Our ceremony was so beautiful and exactly as we wanted. Our wedding coordinators and photographer helped to make our dreams come true. Our cabin was perfect. Honeymoon Hills is the place for the perfect start to any couples' future. Thank you to all who made our dream a reality. Wow! Honeymoon Hills Chapel and First Love cabin was such an exceptional experience for us. The grounds, staff, cabin and ceremony really set a standard for our returns to come. At first we didn't know what to expect, but once we arrived we were speechless beyond measures. The cabin was so beautiful, clean, warm and cozy--like nothing we have ever seen before. We thought places like this only existed on television. 12-10 was our wedding day. I don't remember worrying about a single thing! The coordinators and Minister were so personal, service oriented, yet they almost felt like family. My bride thought Titania seemed to have teared up before the wedding because we were in so much bliss and so happy! We really appreciated all the help on our big day. Gatlinburg is such a beautiful town. This cabin was perfect, we really enjoyed it. All of our needs were met! Our wedding was lovely and the staff made it be everything I dreamed it would be. I love our wedding coordinator Titania to death. She was there for me with everything I needed. We honeymooned here and decided to come back for our anniversary. Honeymoon Hills helped us get the same cabin 'First Love' which was our original honeymoon cabin. They were very courteous and helpful. The reservation was a breeze. In ten minutes I had everything planned. We were so excited to spend three nights in 'our' cabin. Thank you Honeymoon Hills for making our anniversary just as memorable as our honeymoon. We love it and would recommend for anyone wanting a quiet romantic getaway. We loved the cabin--very romantic to celebrate our 21st Anniversary. We will recommend it to our friends. The name of this cabin was perfect because my husband and I are actually each other's 'first love'. Everything about our experience has been fantastic! The area is absolutely gorgeous, very well maintained and well kept. Our cabin was beautiful, immaculately cleaned, well stocked and our gift basket--WOW! The staff was all very helpful, very friendly, just made us feel so special and at ease with everything. Our wedding ceremony was perfect! The words of the Minister were genuine. We felt like they were chosen just for us. Our photos of the wedding were fantastic, very professional looking. The Chapel and surroundings are beautiful as well. We looked at several places and we are absolutely thrilled that we chose Honeymoon Hills. This was the best place to get married and honeymoon! Thank you for allowing us to stay at Honeymoon Hills. Sometimes we forget to take some time for our significant other. Allowing us to enjoy your cabin has brought us back closer. We really enjoyed our time there. Your staff really took great care of us! We very much enjoyed our stay at the cabin First Love. Our trip was for our 10 year wedding vow renewal. We couldn’t be more happy. The cabin was great. Very nice and peaceful. We hope to come back at our 20th year anniversary and share our vow renewal again. We took this trip to celebrate our wedding and honeymoon. Our cabin, First Love, was wonderful. It was actually even prettier and nicer than I was expecting. We went to Ober Gatlinburg during our trip. Everything was so much fun. We will definitely be back! My wife and I booked this trip as our honeymoon getaway. First Love cabin at Honeymoon Hills was the perfect place for our stay. It was a peaceful, rustic, and cozy cabin that suited our personalities and our expectations. While we were in Gatlinburg we ate at several restaurants but Locco Burro was one of our absolute favorites. We were able to dine out on the balcony overlooking the main strip at Locco Burro plus the food was to die for! We also visited Stars Cars. We felt like we were home when we got to the Mayberry Police car because Mayberry was based on Mount Airy, NC which is where my wife was from. Thank you to the friendly staff, we can’t wait to visit again! Thank you so much for the beautiful day you created for us! Your flexibility and sweet natures made for a day less stressful and more enjoyable. Our Minister was personable and very thoughtful. Thanks again for making our special day beautiful. Our trip was to celebrate our honeymoon. Everything was very quiet at First Love. Of everything we did, we enjoyed the cabin the most with the fireplace and jacuzzi, we will be back for a getaway one weekend. It felt like our First Love. We enjoyed the Lumberjack Feud Dinner and Show, Hatfield and McCoy Dinner Show. Mama Farmer was a heat place to eat. This was our first time at Honeymoon Hills and we were very impressed! Our cabin (First Love) was adorable, extremely comfortable and had all we needed. The fireplace at was a romantic touch we enjoyed. Our wedding ceremony was perfectly performed by Dr. Dan. He was the best! My husband inadvertently blew our the wrong candle during our ceremony but we all laughed it off! Dr. Dan went with the flow and knew just how to handle it. he performed a beautiful, yet perfect wedding ceremony for us, almost like he had known us for years! Our family was very happy with everything as well. We will definitely be back for our anniversary! We loved First Love! Everyone was nice and helpful. The cabin was very private and sweet. Bennett’s BBQ was awesome. Excellent! Great place, great time. Thank you!!! Our stay at First Love cabin was incredible to say the least. It was the perfect set-up for our engagement. The staff did a phenomenal job with the decorations. The rose petals, chocolate covered strawberries, heart-shaped cake, dozen of red roses and heart-shaped balloons made this an enchanting cabin that will remain in our memories for a lifetime! This cabin could not have made such a special occasion any more perfect. During our stay in Gatlinburg we enjoyed the shopping, the Skylift, Ripley’s Aquarium and our romantic dinner at the Vista Grill. Thank you so much for all you did!!! This trip was to get married and spend the weekend. Our favorite attraction was the Lumberjack Feud, Dixie Stampede, and the Aquarium. We visited the Wax Museum, Chaos Castle, House of Mirrors and Country Music. We like the Alamo restaurant and J. T. Hannah. Our stay at First Love cabin was by far the best stay we have ever had! In Pigeon Forge our favorite places MagiQuest, Wonderworks, Adventure Ziplines, The Original Old Time Photos. In Gatlinburg our favorite places were The Peddler Steakhouse, Ole Smokey Moonshine and Davy Crockett’s. We had the best vacation ever at the cabin First Love. It was a perfect cute little couple’s getaway! First Love cabin at Honeymoon Hills was a gorgeous place to come for our honeymoon. The cabin was small and cozy, the heart-shaped jacuzzi was really cool. 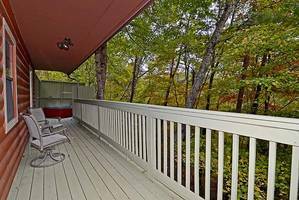 We loved the quiet, private back deck where we enjoyed the peace of nature. We loved Gatlinburg...definitely had 2 favorite eating place... Flap Jack's and Friday's food was just beyond good! Visited Believe It or Not, the Guiness World Record, but more than those big attractions, our favorite places to go were those little shops along the side streets, pottery shops, art galleries, etc. Those shops held the aura of long ago & were so relaxing. We also loved touring the Titanic. That was our favorite. We definitely loved our time spent here and would love to come back! We enjoyed the peace and quiet with no interruptions at the First Love cabin. Our trip was to celebrate our wedding. My favorite place was Pigeon Forge and all the outlet shopping. We didn’t really see the attractions but we did eat at the Hard Rock Cafe. This was an amazing experience for us. The First Love cabin was perfect for our requirements. Exactly what we needed! Thank you…we will visit again! Honeymoon Hills was really a beautiful place. We really liked the openness and the look of the First Love cabin. Thank you very much for making our stay so lovely! From reserving the cabin First Love to walking down the aisle, the staff at Honeymoon Hills did a terrific job! The cabin was very clean and located close to the strip. I would love to bring my family back again. We chose Gatlinburg as a getaway trip for our anniversary. We could not have asked for a more romantic time! The City of Gatlinburg was absolutely beautiful with all the Christmas lights. The First Love cabin was perfect. I wish we didn’t have to leave. The staff was super friendly and attentive while giving us our privacy. I don’t think I’ve ever had a better experience. 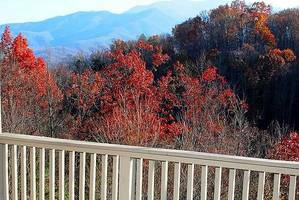 If you decide to visit Gatlinburg, stay here, ride the Space Needle and Gatlinburg Sky Lift. You won’t forget the views! 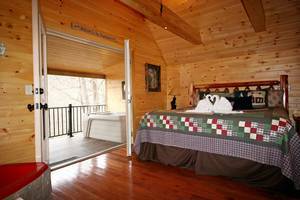 The First Love cabin was perfect for our second honeymoon. The sparkling cider and rose petals were on the bed when we arrived making this trip magical from start to finish! Our trip was to celebrate the marriage of Tonya Jones & Jerry Rutherford. There are so many wonderful things to do, just too bad we did not have enough time to enjoy them all. We would love to in the future. We went to several places on the main drag in Gatlinburg and really enjoyed everyone of them that we visited. As far as restaurants we kind of wish we had the time to try and sample each one of them. We really enjoyed our time at the First Love cabin and the wedding at the Chapel at Honeymoon Hills. We loved going to Gatlinburg where we became husband and wife! God has blessed us. We enjoyed the First Love cabin. The minister and photographer were amazing. We went to several shows and enjoyed trying new restaurants. God bless Tennessee and the people there! We didn’t want to leave!!! We loved the place! My husband and I came to Honeymoon Hills as newlyweds. It was the best choice we could have made for our honeymoon. When we first arrived, the crew had the temperature just right, the lights were on, and the place was spotless. After a long drive, it was refreshing to have such a cozy, r romantic place to arrive and stay. We took advantage of the free tickets to various attractions such as the Dixie Stampede, the Zip Lines, and Wonderworks. Our favorite attraction was above the chimney hills in the mountain and the Brick Oven Pizza right down the road. We were spoiled there. 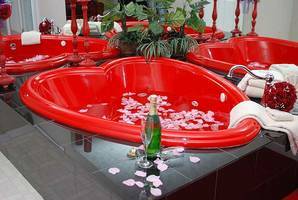 We had the jacuzzi, toasting flutes and sweets for our romantic experience. My husband and I will start a tradition of going back every year in October. Maybe, we will go for Christmas as well. We will be back! We really enjoyed our stay in the First Love cabin at Honeymoon Hills! 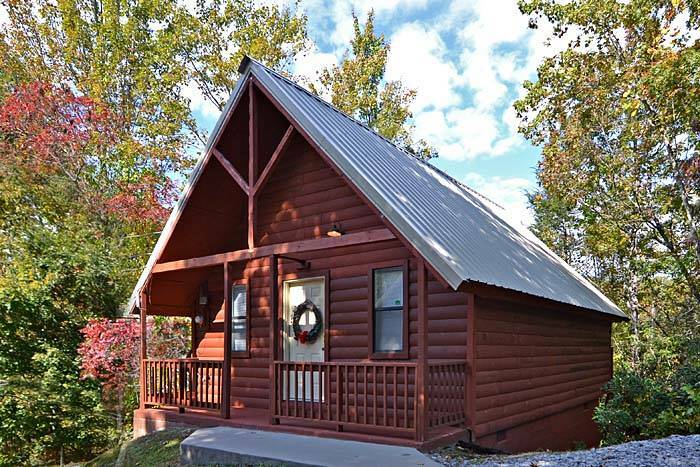 The staff was very kind and helpful, the cabins were beautiful as well as practical for our needs! I would recommend these cabins to anyone looking for a special getaway! Thanks Honeymoon Hills, this was a lovely place! Our cabin was very wonderful, we loved it. We can't wait to come back. We could not have picked a better place to stay! My wife and I loved it. We would like to come back.